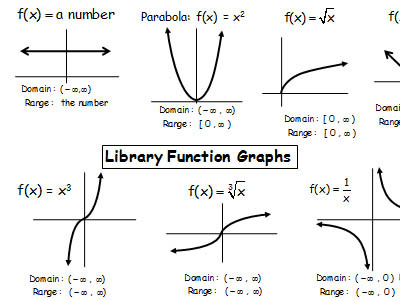 The reason that so many students have trouble with graphing transformations is that teachers always introduce them simultaneously with another tough concept: library functions (a.k.a. parent graphs). That makes each concept ten times harder. So, to get you back on track, I teach transformations using just one library function that everyone knows - the parabola - before introducing the library functions, then I work TONS of examples to cover every contingency. (Check out my printable pdf of Library Functions below, including square root functions, cube root functions, cubic functions, absolute value functions, etc.) Lastly, we'll look at Piecewise Functions, those mathematical Frankensteins which every student hates. Graphing crazy library/parent functions with stretch, flips, and vertical and horizontal shifts is pretty confusing for most students. So, in this video we'll start by applying transformations to a function everyone is already comfortable with -- parabolas (y=x2) -- to get the hang of it before moving onto other weird shapes. By the end of this video you'll be able to move a parabola up, down, left, right, inverted & stretched! In this video we'll start moving the library functions (square roots, parabolas, cubics, etc) around one or two shifts at a time -- up & down, left & right, inverting, stretch -- before tackling the super-hard examples of the next video. The parent graph (a.k.a. library function) graphing examples in this video are more towards the psycho-hard end of the spectrum, bringing up to four transformations at once to each of the library functions (square roots, parabolas, cubics, etc). Up shift and left shift and vertical stretch and reflection you say? Hold on to your hat! They should be called the Frankenstein Functions, because they're monstrosities cobbled together from pieces of other library functions: lines, parabolas, square roots, cubics, cube roots, and absolute value. Like the actual Frankenstein, piecewise functions are more vulnerable if you break them into their constituent parts.